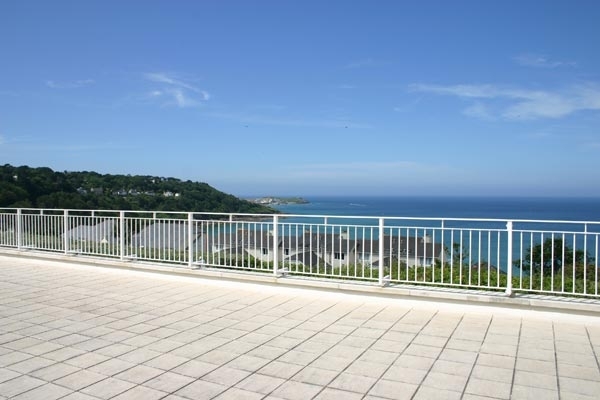 Compass Point Apartments has superb views of St Ives Bay and are just five minutes from the delightful Carbis Bay beach. For luxury self catering St Ives holidays, Compass Point Apartments offer you modern and stylish accommodation fitted and furnished to the highest standard, centrally heated and double glazed for year round comfort, inspected and graded by Quality in Tourism, Visit Britain. With allocated private parking, you can leave your car and use the single track railway to St Ives - just 2 mins. away or stroll down the hill to the Blue Flag Awarded Carbis Bay Beach. Compass Point Apartments are also convenient for shops, pubs and restaurants. Nearby St Ives is renowned for its Cornish hospitality, once a traditional fishing village, it retains its character with winding cobbled streets, artists studios around every corner, it has in more recent years become famous for its restaurants,the well renowned Tate Gallery and Barbara Hepworth Museum. Visitor attractions including the Eden Project, St Michaels Mount, Lost Gardens of Heligan and of course Lands End are a short drive away. There is so much to enjoy in Cornwalll, so let Carbis Bay Holidays provide the base for you to discover it's delights.